Bill is a potter with an interest in ancient pottery, this page is about how he fired his Bronze Age Bucket Urns and Beakers - as part of the Artyfacts Project. Visit www.raftdorset.info for details. An area of turf was stripped from the field and the ground levelled off. A bonfire was started with some branches to build up a bed of embers. 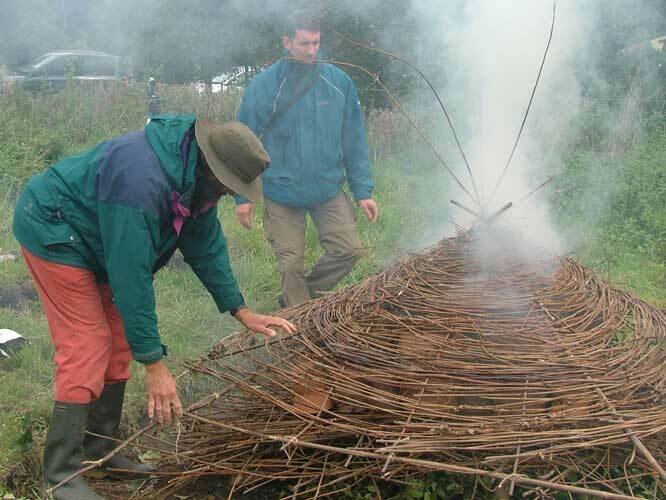 A dozen rafts woven from old willow wands were stacked on a timber stretcher and the dried pots were stacked on top of it. 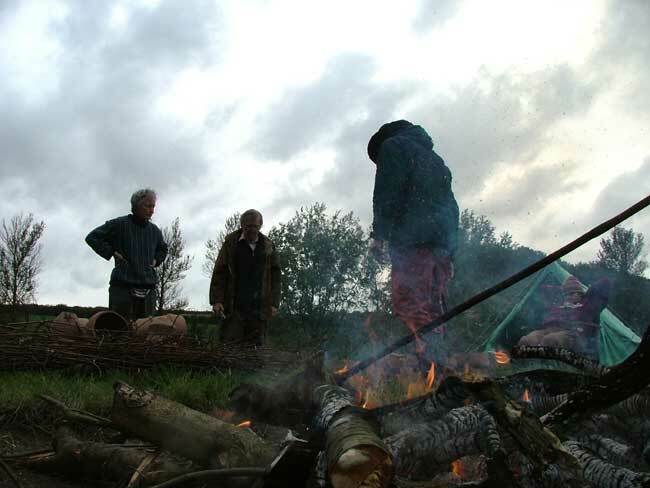 When the embers were ready, the larger unburnt branches were removed and a bed of apple and pear prunings were laid over them to act as a buffer - to stop the burning from happening to quickly. Then the whole raft of pots was ceremonially carried and placed on top of them. More pots were placed around the edges of the raft, in a single layer, at all different attitudes (upright, upsidedown, sideways). 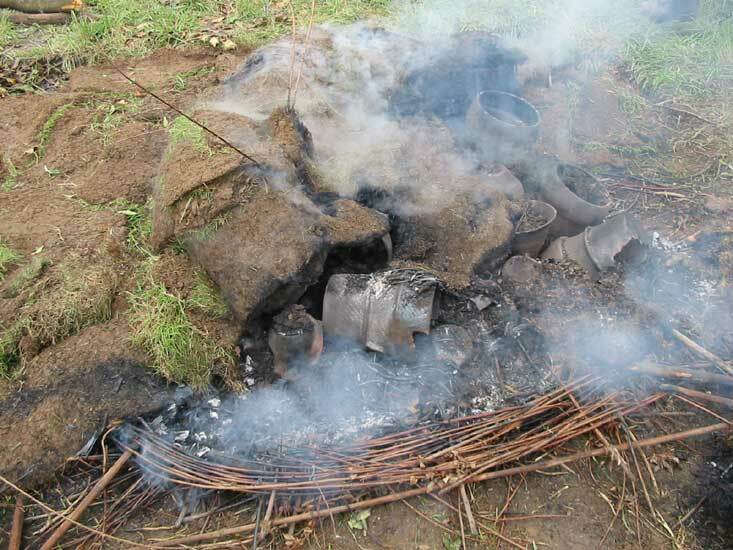 A roof had been made by weaving willow into a frame of bamboo canes, this was placed over the pots, after some brushwood had been placed on top of the pots. By now the heat had started to make smoke, but no flames. The roof was then covered with turf completely to clamp down the fire and prevent air getting in. 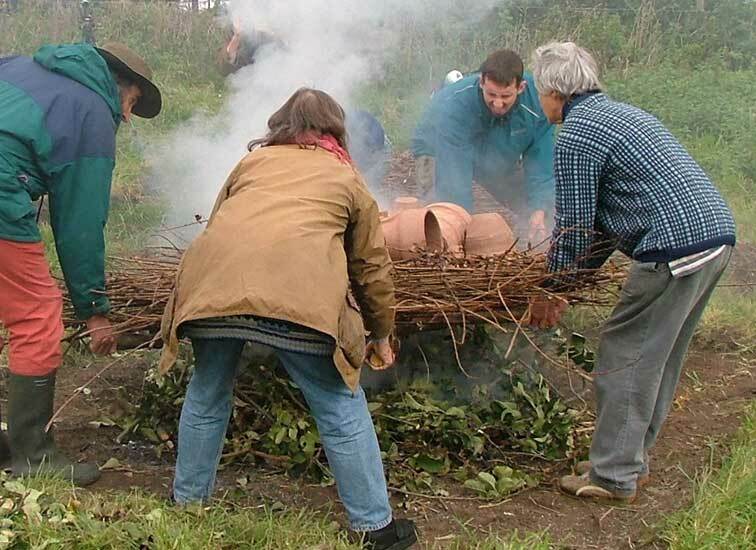 This meant that the fire burnt slowly - gently warming the pots and drying them and heating them. Occassionally, if the smoke stopped seeping out, a turf was lifted to let in some air to revive the fire. If this happened by the turf shifting, the flames would start and the temperature would increase too quickly - with a resulting sickening sound of pots exploding! So a careful watch was kept to minimise this. The following morning the fire had died right down, but there was still some fuel left unburnt, so it was relighted at a couple of places and covered up again. By afternoon the fired had died again and the turf was removed from one side of the clamp. 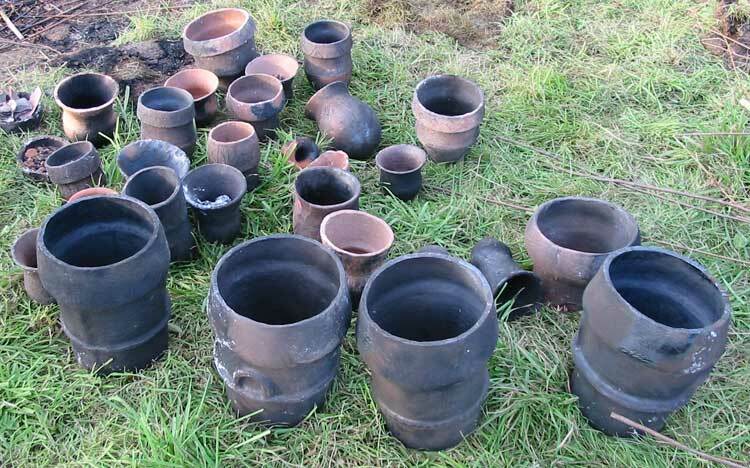 The pots exposed had been shattered by the earlier intense heat, but some looked intact on the other side of the clamp and were left to finish burning and then cooling. Then the turf was all taken away and the pots revealed. 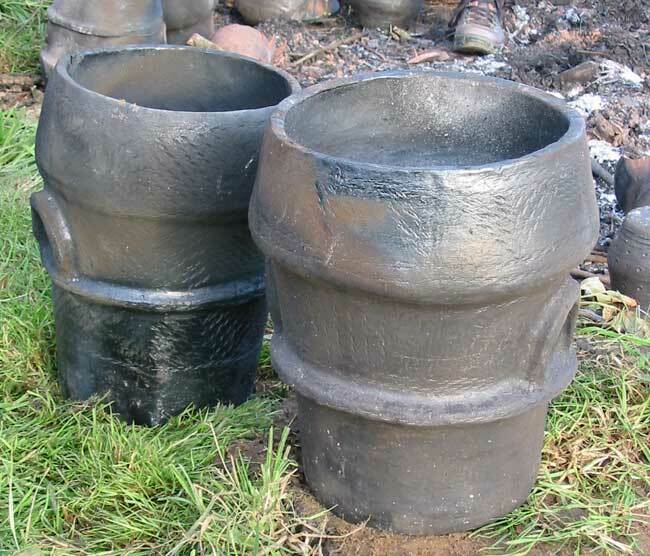 Some of the big bucket urns had survived their ordeal by fire and now looked very authentic, if a bit distressed. These are the pots that came out intact. And these are the broken ones. Not a bad result for such an experimental firing. The smaller beaker type pots tended to survive better, probably because many of them were packed inside the larger urns. The beakers were also made by a process involving more compression of the clay, which helps to strengthen it. 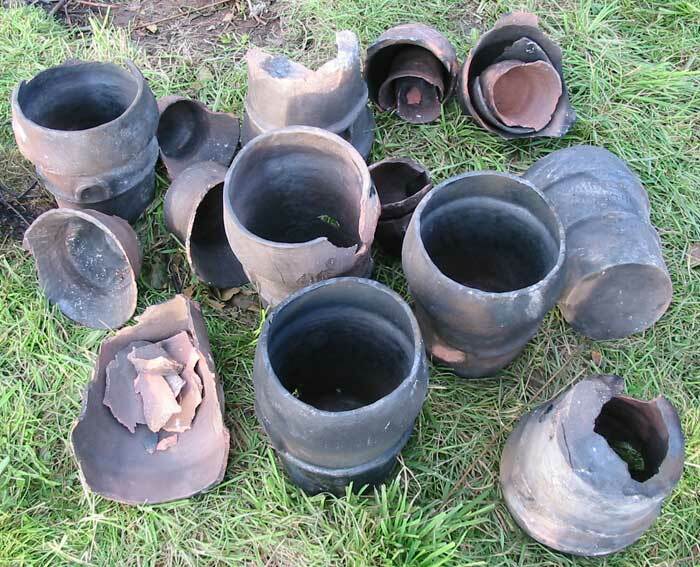 The urns tended to be more exposed to differential and intense heating, almost all of the damage was caused by spalling, where the water in the clay turns to steam and blows the surface off the pot. Gentle heating in a kiln minimises this damage. Some of the wares were slightly under-fired and so are not as strong as they should be, indeed they collapse if left out in the rain! A clamp is difficult to heat up evenly and thoroughly, especially round the edges. There appeared to be little physical damage from the weight of the roof squashing the pots, although one urn in a corner was probably hurt by this as well as spalling.